The IHS holds an annual International Horn Symposium that draws leading performers, teachers, students, exhibitors and enthusiasts from all over the world. In addition, several regional workshops are offered each year in the U.S.and other countries. Application can be made online. Only logged in, current IHS members may access the application forms. The International Horn Society (IHS) will, as funds allow, support regional workshops with assistance of up to US$200 for a one-day workshop, and up to US$500 for a two- or three-day workshop. Funds are awarded as requests are received, so early application is recommended. The host must be a member of IHS. Because funds are limited, the planned workshop must serve an area or region beyond the host’s own institution, and the IHS will support workshops at the same institution or location for only two or three years. The IHS recommends that regional workshops be moved to different locations each year, and that the hosts coordinate with previous hosts or co-hosts to achieve maximum numbers of participants. (Regional Workshops outside the United States may be supported for more than three years in the same location). The IHS recommends that regional workshops should not be scheduled in close proximity of time or place to the International Horn Workshop/Symposium of the same year. The host must file an Application for IHS Regional Workshop Assistance with IHS Secretary/Treasurer indicating proposed clinicians and a tentative workshop schedule. If the application is approved, the IHS grant may be payable prior to or at the conclusion of the workshop. Information and announcements about the workshop should be sent to the IHS News Editor and the IHS Online Webmaster. Please allow ample time for publication. The IHS must be acknowledged as a co-sponsor in the workshop program. The workshop host must make a reasonable effort to promote the IHS and International Horn Workshops/Symposia at the regional workshop. IHS brochures and flyers for the upcoming International Horn Workshop/Symposium will be made available to the host upon request. A price differential between registration fees for IHS members and nonmembers is recommended. Although businesses may participate in the workshop as exhibitors, or advertisers in the workshop program, the support of the regional workshop by the IHS should never imply the IHS’s endorsement of any particular commercial enterprise. The IHS maintains a position of separation for IHS and business enterprises. Two copies of the workshop program, attendance information, and a final budget summary must be sent to the IHS Regional Workshop Coordinator, one copy for his/her records and one copy to be sent to the IHS Archives at the conclusion of the workshop. Failure to submit this report may jeopardize future IHS funding for the host and/or the event. In an effort to promote IHS membership, all Regional Workshops are authorized to offer the current “horn club” annual membership rate for onsite registrations. Membership applications and dues collected at the workshop should be forwarded to the IHS Executive Secretary in one submission. Hosting an International Horn Symposium: Mysteries Revealed! For years, the IHS Advisory Council has made decisions on where to hold its annual international workshop/symposium based on a bidding process. This means that in order to hold this event anywhere, we need an individual and a sponsoring venue or institution willing to host it. We do not select sites on our own and then try to find a local host (some societies do this). Quite the opposite, hosts apply for consideration by submitting a budget and plan for the event to the Advisory Council. This represents a significant commitment just to get the bid itself together. The IHS's International Workshop Coordinator, currently Nancy Joy, is integral to the process from the start, not only working with potential hosts and institutions to put together realistic plans for hosting, but also soliciting bids from prospective hosts. Because of the current majority of members from the US, the general desire for choosing symposium sites has been to hold the annual symposium two years in the US and then one year outside the US. Sometimes it works, sometimes it doesn't, depending on the number and quality of bids we receive. It really comes down to needing a host and sponsoring venue willing to make the commitment to invite the IHS to visit. Admittedly, there is much a host and sponsor can gain in professional reputation, but they must decide it is worth the risk before they even begin. What initially struck me about IHSLA was the superb organisation of our hosts Annie Bosler and Andrew Bain – the efficient staff, the Colburn School and the many varied and superb venues, the detailed and comprehensive schedule of events and the impressive line-up of featured artists. That was just for starters. As a “seasoned professional” and many times a featured artist myself, I have experienced both unsuccessful and successful Symposia over the years and was therefore both interested and excited in the build-up to IHSLA. An added interesting to me was how this event would impress my 14-year old step-daughter – who, although coming from a musical family on both sides, was at her very first Horn Symposium. On speaking with her about the week, she said that what delighted her most was watching and hearing the great players, then meeting them afterwards – the people, like Andrew Bain and Sarah Willis, whom she had seen on the TV and were here in person – and then amongst us chatting and having a laugh. The Berlin Phil horns was especially interesting for her coming from Germany and having a father who plays principal double bass in the Essen Philharmonic. Los Angeles was a wonderful venue and held many more attractions that just the IHS Horn Symposium – which for a 14-year old, having first-hand knowledge of how much of the world of film and TV come from this part of the world was an added bonus and one that fulfilled all expectations. LA 2015 will be one Symposium my family and I will not forget in an hurry and my thanks and due respect go to primarily Annie Bosler, with Andrew and the team behind her who worked together in making this event such a resounding success – congratulations to you all. The IHS Symposium in Los Angeles was a marvelous experience. This year I was there as a member of the Advisory Council and not as a guest artist. So for me there was a lot of time to hear so many very interesting programs. Of course it was not possible to go to every recital or concert. So many very good players, too many to mention them all. For me it was so good to see again Yu-Ting Su; for me: Tina Su. She was a student during my first master class in Taiwan in 1992. Very gifted already and now she brought a new CD called Watercolors. She played a very good recital with several pieces of this album. Great to see somebody after 23 years, doing so well. Some concerts I have to mention and really were highlights of the symposium. The concert with Arkady Shilkloper, Stefan de Level Jezierski, and the fantastic Big Band of Gordon Goodwin. Such a great pleasure to hear the horn in another way than we hear it normally. Then the tribute to the Los Angeles Horn Club at the Los Angeles Theatre. To hear James Thatcher during this great concert was a very special gift. The concert at the Hollywood Bowl with the Schumann Konzertstück, played by Stefan Dohr, Andrew Bain, Tim Jones, and Sarah Willis was an outstanding performance. Andrew, who organised the symposium together with Annie Bosler, did also a great job in the same program with Till Eulenspiegel of Richard Strauss. Besides many great artists like Julie Landsman and Jennifer Montone, I was very impressed by the horn quartet of the Berlin Philharmonic. Stefan Dohr, Andrej Žust, Stefan de Level Jezierski, and Sarah Willis played two great concerts. I was impressed that they came as a quartet to LA after a very busy year with the Berlin Philharmonic. A great chance once in a life time for many of the visitors to hear this beautiful ensemble – thank you Stefan, Andrej, Stefan, and Sarah. Last but not least, thanks to Annie and Andrew who did an incredible lot of work and organising for this great workshop. You can be sure, Annie and Andrew, that everyone who was there will never forget this event, which the two of you made possible for all of us. 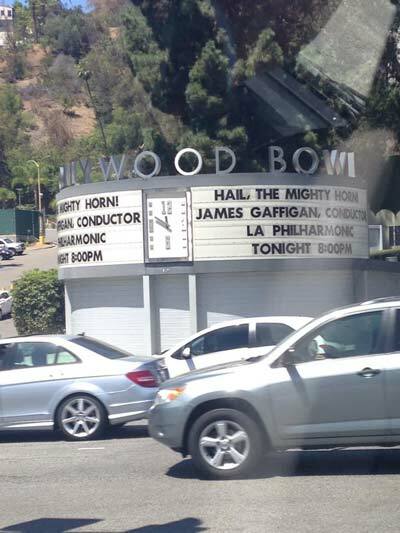 The highlight to me, because of the venue and the atmosphere, was the concert in the Hollywood Bowl, For a Welshman to experience all that, following what I knew of the work that Alf Brain did there was amazing. On the recital side, the playing of Stefan Dohr was amazing, and also that of Andrej Žust (this guy is some player – good musician too). Sara was great, solid, and dependable on fourth. I know I have “gone“ for the BPO, but this time they were outstanding, better than the London performances. I will not associate “Nessun Dorma”any more with Pavarotti, but with the last “scream” of Stefan Jezierski. Ha, Ha. I didn’t go much into the area of mouthpieces and exhibits. The work that Annie had put in was amazing. I know Bain was in the title, but the day to day running was totally down to Annie, and she was superb. The Colburn was a blessing – we had everything on one site, everything was so close and convenient (well, except the Hollywood Bowl, Japanese Cultural Center, and Los Angeles Theater). I don’t know why they had to go to other theatres (apart from the Bowl) when they had the Colburn Halls? It is going to be, in total, one hell of a Symposiun to follow. Said enough now. Ha – Ha. IHSLA was fanatastic! It was so great I didn’t get to see anything I wanted to do while I was there! I had a very ambitious program of seeing the beach, the Walk of Fame, Beverly Hills and maybe the desert close by. Instead, I spent my whole days listening to great horn playing, new pieces, old pieces played in a new way, great talks, ideas that changed my approach to teaching and playing, concerts of awesome bands, orchestras, chamber music groups and just horn players. But above all, I found a united community of people who share the same love as I do for the magnificent sound of a musical instrument! I just can’t wait for next year!!! It is difficult to write a Horn Symposium report – one carries expectations of performances and exhibits, but there were the smells and the sights unrelated to Symposium (a goldplated Ferrari), and the unscheduled conversations at breakfast, in a hallway, or even, this year, at a pub. Getting to the Imperial College in London was difficult for many – the long walk through the Heathrow airport, the longer lines for Tube ticket, and then the hike from the South Kensington station to the site. Upon arrival, however, we found the facilities in close proximity. The Imperial College, the facility host Jonathan Stoneman chose for the Symposium is not a music school but a technical school, so the performance halls were large classrooms – Jonathan bought enough wire stands for an orchestra! While the venue may not have been ideal for a music convention, it was excellent for easy access to exhibits, a dining room, dormitories, and lecture halls. The weather was cool, it rained a bit, and the dorm rooms were tiny but comfortable. Breakfasts were eaten in a large dining room with students and participants from several conferences – the food was the same every morning but there was a good variety and plenty to eat. IHS participants could buy a meal package or fend for themselves for lunch and dinner. With a little searching, one could find both expensive and very reasonable food in the area. The Symposium opened on Monday morning August 11 with horn choirs from the Royal Academy of Music and the Royal Northern Academy performing both jointly and separately in an enjoyable concert. The first afternoon recital featured Andrew Pelletier and Richard Watkins playing only new works – all difficult but well performed. The New York Philharmonic horn section then played arrangements of US pop and show tunes (trombone arrangements transcribed for horns). Because that recital went long many of us missed the following interview and a presentation by John Cox (Oregon). At 4 p.m. the Bergen Philharmonic horn quintet performed arrangements of Norwegian music followed by the American Horn Quartet performing Turner’s Third Quartet and West Side Story arrangement. Ensemble competitions followed. The evening BBC Proms concert featured the BBC National Orchestra of Wales – many Symposium attendees attended that concert standing with many joining the hundreds standing in front of the orchestra for £5! Each morning began with a warm-up and advice on testing horns from a different clinician – Tuesday it was Eli Epstein. Simultaneous lecturers on the Alexander Technique by Kerin Black and Technology in Performance and Teaching by Lydia van Dreel were presented at 10 am. The 11 am performance by the Japan Horn Society, Horn Pure (Thailand), and Mallet Horn Jazz Band was moved to a smaller lecture room, so many stood in the back and side aisles. For many, the highlight of three fine performances was Horn Pure, an eight-member group of young hornists from Thailand who performed difficult repertoire with precision, accuracy, and a sense that they were having fun. Nick Smith presented a lecture concerning the European influence of American horn sections at noon, which was overlapped by the 11 am performance. Simultaneously, Ian O’Brien spoke on hearing damage to horn players. The 1 p.m. performance began with two solo pieces performed by Dylan Hart (LA), followed by Brazilian Radegundis Travares performing works with piano from his country’s composers. That “hour” concluded with a spectacular performance by the Budapest Festival Horn Quartet – a major highlight in this reviewer’s opinion. At 3 p.m. one could choose from a Spanish Brass master class on quintet playing or a lecture on the influence of Louis Dufrasne on the US by Jeroen Billiet. At the 4 p.m. hour we heard three works for horn and chamber orchestra conducted by Michael Thompson – Alec Frank-Gemmill beautifully rendered Butterworth’s Romanza, Ab Kostser performed a flawless Mozart Concerto No. 2, and Frank Lloyd concluded with a brilliant performance of Gordon Jacob’s Concerto. Unfortunately, Zdenek Divoky was ill and could not perform. Following that recital Jeff Nelsen presented his lecture on Fearlessness. The evening BBC proms concert was again the BBC National Orchestra of Wales performing the music of Peter Maxwell Davies, Walton, and Sibelius. Wednesday opened with another warm-up with Ilene Chanon, followed by a lecture on the Viennese Sound Concept with Gergely Sugar, against another Alexander Technique session with Black. Because Zdenek Divoky was ill, the Czech-American Duo with Steven Gross was not able to perform on the 11 am concert but the South Queensland horn ensemble stepped in with a contemporary work followed by the American Horn Quartet’s rendition of Tippett’s Sonata. At noon there were three simultaneous lectures by Engelbert Schmid (acoustics and craftsmanship), Tiffany Damicone (Bohemian Singing Sound), and Vincent Andrieux (French horn players from 1899- 1929). The 1 p.m. recital featured the two excellent Hawkins Competition winners, Ana Beatriz Menezes and László Gál. A Japan Horn Ensemble then played Eric Ewazen’s Bridge of Dreams (with the composer present), followed by the Jim Rattigan Trio (horn, violin, piano) performing works from his latest jazz CD. There were two events at 2 p.m. and if you didn’t make it into Sarah Willis’s Horn Hangout with Terry Johns by 2 p.m. it was streamed without you. Randy Gardner reminded us of our practice fundamentals at 3 p.m. The 4 p.m. recital was again spectacular featuring the Spanish Brass who performed a plethora of music from all sorts of genres over 45 minutes from memory, and Trompas Lusas, who belted out an amazing assortment of quartets. At 7:30 p.m. a one-man, one-act play inspired by Jasper Rees’s book was performed. The sole actor, Jonathan Guy-Lewis, did an outstanding job with all sorts of “in” horn humor and actually performed the second and third movements of Mozart’s Concerto, K. 447 as Rees may have, improving as he went along. It was an outstanding and moving performance. Thursday began with either a guided warm-up with Martin Lawrence or a lecture by Randall Faust on the history of the IHS Composition Contest. At 10 a.m. John Humphries lectured on 19th-century horn players in London against another Alexander Technique presentation by Black. The 11 a.m. performance was unfortunately moved to a venue that could not seat the crowd. Here a group of trompes-de-chasse led by British Horn Society President Chris Larkin performed works by the Dampiere and Kling. Ensemble Mengal from Belgium then performed octets for six natural horns and two trombones by Mengal to stirring applause. Natural horn virtuoso Anneke Scott played last due to the fact that her train had been delayed that morning. She did not disappoint with a flawless performance of variations on a Donizetti melody for horn and piano. When she discovered the last page missing from her stand, she turned and read from the piano part – those of us close enough were treated to an exotic hand display in her bell. The noon hour included another presentation by Eli Epstein about “finger breathing” opposite one in a series of interviews during the week by Tony Catterick. Unfortunately Anthony Halstead was not able to attend due to illness. At 1 p.m. we heard horn duets with Anneke Scott and Joseph Walters, the group of British players again, this time on Vienna horns, performing works by Weber. Jean-Pierre Dassonville performed an Intermezzo by Dupont on a six-piston-valve instrument made by Adolphe Sax – impressive! Likewise was the performance of Gallay’s Quartet for four horns in four keys led by Anneke Scott – brilliant! At 2 p.m. there was a lecture by Jeffrey Snedeker on the nineteenth-century Paris Conservatoire followed at 3 p.m. by either a master class with Anneke Scott or a panel led by Daren Robbins on alternative careers in music. The 4 p.m. performance began with Jeffrey Snedeker playing Weber’s Concertino on natural horn followed by the Ensemble Mengal, this time performing on piston-valved instruments the music of Ryeland and Dubios – very impressive. 5 p.m. was a light-hearted duet presentation by Sarah Willis and Klaus Wallendorf of the Berlin Philharmonic advertising their new CD. The British Horn Society held their annual general meeting between the duet presentation and the 7 p.m. orchestra concert. This concert began with Ligeti’s seldom heard Hamburg Concerto performed by Andrew Pelletier, followed by Richard Watkins in a performance of Colin Mathews’ concerto. The final work on the program was a rousing rendition of Schumann’s Konzertstück with the New York Philharmonic horn section. The Proms concert that evening included works by Sibelius, P. M. Davies, and Bridge, performed by the BBC Philharmonic. Friday’s warm-up hornist was Tim Thorpe of the BBC Wales Orchestra, followed with simultaneous lectures by Peter Kurau (Transference Learning) and Kerin Black (Alexander Technique). The 11 a.m. recital feature Bernardo Silva, Rose French, and the Budapest Festival Horn Quartet. The quartet performed the Schneider and Hübler Concerti for four horns. At noon a quartet from the Berlin Philharmonic performed light-hearted quartets mostly arranged by Wallendorf, to the enjoyment of the audience. That concert began and ended late so the picnic at the Albert Memorial in Kensington Park, about ten minutes walk from the Imperial College, also began late. There was a quickly assembled performance of the Liberty Bell March for soloists and massed horn choir (music clipped on the lanyards for the person behind to read). Due to dark clouds and a bit of rain, the concert was called after about 10 minutes. While the participants ate a sack lunch, Horn Pure from Thailand and two quartets performed, one from South Texas that had won the quartet competition. The Symposium ended with Tim Thorpe performing with piano, the South Queensland horn choir, and then the Budapest and American Quartets joining for two Kerry Turner works, ending with Bronze Triptych by Turner for 12 horns and percussion. The IHS general meeting ensued followed by the BBC Scottish Symphony at the Proms, ending the day with a rousing Ein Heldenleben. Thanks to Jonathan Stoneman for a superb week, well-planned, and well-executed. For he’s a jolly good fellow! Click on the markers on the map below for more information on upcoming festivals and workshops featuring the horn. The theme of the 45th International Horn Symposium, hosted by Dan Phillips at the University of Memphis was “Horn and Song.” It was an excellent theme and was evident in every recital and concert program at the symposium and in many of the other presentations and lectures. The University of Memphis campus is moderately large and attractive. The events did not take place in the Music building but rather two venues that were just across from each other – the Michael Rose Theater and University of Memphis’s University Center (student union). The larger Rose Theater could seat more than the 700 participants who came but, with the less resonant acoustics of a theater, the performers found they needed to play from near the front of the stage and some of us found that sitting close to the stage allowed for a better acoustical experience. In contrast, the small hall in the University Center had very nice acoustics but limited seating. Even the tiny grand in that hall sounded fine. The University Center’s upper floors housed the exhibits in several rooms, some with many exhibitors and a few with one or two. The layout seemed well organized and there was enough time during the day to visit the exhibits repeatedly. Typical of the majority of recent International Horn Symposia, often two or three events were scheduled simultaneously so we all had to select carefully until the single evening performance. For example, on the first morning I chose to hear Engelbert Schmid’s lecture on horn acoustics (where he performed a work after about 25 years of just making horns). Jeff and Nina Nelsen and Luiz Garcia shared an afternoon recital that included very nice works well performed. Carmen’s Toreador Song for soprano and horn duet may have been the hit of the show. That evening Frank Lloyd and his wife, Rachel Robins, and tenor Randal Rushing performed a variety of works, including the rarely heard Heart of the Matter by Britten. On Tuesday morning I chose to hear Karl Kemm’s lecture on the history of brass and the horn, and I was very glad that I did – it was a superb presentation with instruments, slides, and live performance on a variety of historical ancestors. After an enjoyable participants’ recital in the same hall, we went off to lunch. Each day two or three horn ensembles performed at lunchtime in the cafeterias. Fortunately (or unfortunately), the programming and playing on these events was much tastier and imaginative than the food – the chef must own a can opener and be able to also open frozen vegetable packages and boil the contents. When meatloaf is the star of the week.... And the huge plastic glasses for soft drinks were the ones that NYC’s major was trying to ban not long ago! And boiled okra? At 1 pm, Liz Freimuth (principal, Cincinnati) and Jasper de Waal (principal, Concertgebouw) performed some opera duets on the first half of the program and Jonathan Boen (principal, Chicago Lyric Opera) performed an entire transcription of Scriabin’s piano etudes. Although this was probably too much music from one composer, his legendary technique was well demonstrated. Afternoon lectures were well done and the prelude to the evening concert was billed as the Chicago Horn Consort, which it was, but some of us wrongly anticipated some of the symphony or opera section to be members. The evening’s concert featured a first half performed by Eric Ruske. Ruske’s stage presence was exemplary – he performed his entire set from memory, and remained on stage and introduced works while his pianist, then harpist, the pianist came and went. After intermission came the premiere of Cantata No. 4: Canticum Sacrum, “Canticle of Zechariah” by Robert Bradshaw featuring Bill VerMeulen, horn soloist, also with a vocal soloist, strings, horn quartet, percussion, and off-stage trumpet (performed by Mark Boren who commissioned the work). Kudos to Bill and the horn quartet for nailing the parts! Each day began with a warm-up session featuring various teachers, followed by a selection of lectures, recitals, and/or master classes. I tended to go to the recitals where I could often hear new music (to me). At least 20 works were premiered during the symposium! Joan Watson’s recital of songs my mother taught me that afternoon was enjoyable. After reading her bio in the program booklet, I expected the presentation to be more substantive. The rest of the afternoon and evening was take up by a trip to the Redbirds minor league baseball game where a group of some 200 hornists performed the National Anthem. Following this was a barbeque and the game watched from high in the bleachers outside third bass. Fortunately, the game didn’t go into extra innings (the Redbirds lost in the final inning). The trip was fun for all although I personally expected the barbecued ribs to be more outstanding. Highlights of Thursday included an afternoon recital featuring hornists Abel Pereira and Jasper de Waal. A faculty bassoonist joined Pereira in works for the two (with piano). Pereira is a wonderful player but the literature did not show his abilities very well. Jasper de Waal’s Brahms Trio performance was a highlight of the week (as was his Mozart Concerto No. 3 later in the week). The prologue to the evening’s concert was a half-hour performance by The Four Hornsmen of the Apocalypse, whose well-oiled and humorous presentation earned them a standing ovation. The following concert was “unique.” Angela Barnes, second horn of the London Symphony presented a very solid performance of several standards from memory. The ensuing performance with a men’s choir and horn quartet from the Memphis Symphony was enjoyable. The final work of the evening, the premiere of Walden at Evening for choir, horn solo (Boen), and percussion by Pamela Marshall was well received; I am not sure that it will ever be performed again, but the premiere was very well prepared and executed by all. The Friday afternoon recital featured music of Eric Ewazen, who was in attendance, conducted his works and led composer discussions during the week. Ewazen’s jolly nature is infectious! Bruce Richards performed on Wagner tuba in that recital and we heard a horn quartet that had won an IHS Commissioning Assistance award. This was an interesting recital. The Friday evening concert was designed to be the artistic peak of the week and was. Following a fine performance of Rossini’s Overture to Semiramide was the premiere of a horn concerto by Tinoco, with Abel Pereira as soloist and we got to hear him for really the first time. There was Britten’s In Memoriam Dennis Brain performed by The Four Hornsmen of the Apocalypse. A horn trio (Boen, Luff, Watson) performed Beethoven’s “Abscheulicher” recitative and aria from Fidelo with soprano. Following intermission we heard two marvelous performances of Mozart’s Concerto No. 3 (de Waal) and Britten’s Serenade (Lloyd and School of Music Director, Randal Rushing, tenor). The final Saturday’s morning events included the annual IHS General Meeting, surrounded by the guided warm-ups, lectures, and a contributing artist recital. The afternoon was the time for the participant choirs conducted by Nguyen and Faust as well as an “All-Star Horn Big Band” conducted by Matlick. After a prelude by the Florida State University horn choir, the evening “performance” was supposed to be a humorous departing event featuring Prof. I.M. Gestopftmitscheist (Kendall Betts) and company in “world premieres,” including the music of Otto Fisch (first introduced at the Symposium in Manchester, UK), and a surprise visit from Elvis. Let’s just say that the Florida State University Horn Choir was the highlight of the evening. Thanks to Dan Phillips for organizing a wonderful Symposium and his students who made it run smoothly. Special thanks to all the collaborative musicians (pianists, singers, instrumentalists) who contributed their time and musical excellence in making the performances first class. The Bloomington Symposium was a smorgasbord of delightful dishes. The wait staff included the organized and efficient IU horn students; the master chef was Rick Seraphinoff, who planned and executed the menu with grace and wizardry. The legacy of Philip Farkas and his successors, Michael Hatfield, Myron Bloom, and Rick Seraphinoff, representing perhaps the leading American University horn department of the twentieth century, were naturally featured during the Symposium. Each day was packed with offerings, sometimes two at a time, and every one a gem. Amateurs, students, professionals, teachers, and other interested parties could choose to attend several sessions or none, while they tested horns, purchased music, or just “hung out.” Because meals were not offered in one location, informal interaction between participants and artists was limited but overcome by those who chose to do so! For each hornist that attended there were highlights. To ask any participant to name those events would result in a list of most of the offerings, from the early warm-up or yoga sessions through the master classes, lectures, performances by university teachers and orchestral players, university and area horn choir performances, to the evening artist recitals. The Camerata Orchestra that accompanied soloists for (not one but) two evenings, did an extraordinary job with a diverse, challenging, and sometimes obscure horn repertoire. Kudos to the orchestra and their conductor, Paul Gambill.